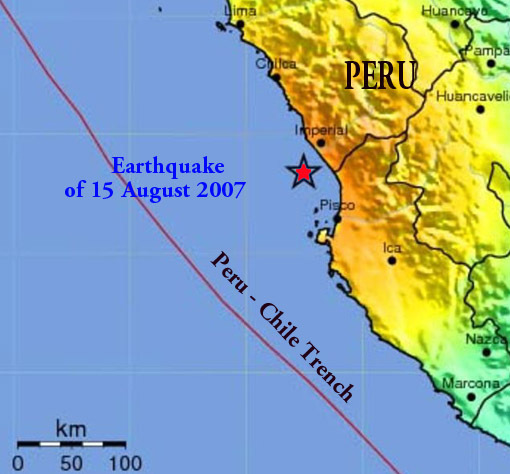 A great earthquake with Moment Magnitude of 8.1 occurred in Peru at on August 15, 2007. The quake damaged extensively the Central/Southern Peru region and was particularly destructive at the Peruvian cities of Ica and Pisco, south of Lima. The earthquake caused several landslides and closed roads. A locally destructive tsunami of up to 10 meters in height was generated. The far field effects of this tsunami were not significant. A regional tsunami warning was issued and subsequently cancelled. Epicenter - Off the coast of Central Peru, at 13.353 S, 76.510 W (USGS), 25 miles (40 kilometers) west-northwest of Chincha Alta and 90 miles (145 kilometers) south-southeast of Lima. Focal Depth - Shallow, 39 km (24.2 miles). Rupture - According to a preliminary analysis (Tavera et al., 2007), .the fault rupture propagated south from the earthquake' s hypocenter. Aftershocks - Dozens of aftershocks were recorded, ranging in magnitude from 4.5 to 6.3. The largest on Friday, August 16th, on the Pacific coast near the city of Chincha Alta. Periodic aftershocks continued in subsequent days. Felt Motions - According to reports, strong ground motions were felt throughout the Chincha Alta coastal area of Central Peru and lasted for more than two minutes. The motions were extremely strong at Ica, Pisco, and were felt stongly in Peru's capital, Lima. The earthquake caused great damage throughout the central/south region of Peru, and some damage in the capital of Lima. Most of the earthquake damage was the result of ground liquefaction. Also, landslsides contributed to the destruction. The most serious destruction occurred in towns and cities along the Peru's Pacific coast south of Lima, including Chincha, Ica, Canete and Pisco. The number of dead, injured and missing continued to rise in the days following the main earthquake. As of August 18, 2007, according to Peru's Civil Defense Institute, more than 600 people were killed and thousands more were injured. These represent estimates which will probably rise. Most affected by the earthquake were the towns of Chincha, Cajete, Pisco, Paracas and Ica. Pisco - The coastal town of Pisco, a city of 120,000 about 160 miles (258 kilometers) south of Lima, was hardest-hit. At least ten thousand homes (35%) were destroyed or heavily damaged. 20% of the harbor infrastructure was destroyed. Hundreds of people died. The city's main Catholic church crumbled as the quake struck during a funeral. As many as 200 people were in the church at the time. Water and electricity were out, and there were widespread communication disruptions. Cracks in the Panamerican highway interfered with subsequent relief efforts. Ica - In the coastal city of Ica, 300 kilometres south of Lima, there was considerable destruction of homes and many people were killed. The Senor de Luren church collapsed during a service, killing at least four worshippers and injuring dozens. There were power failures. Prisoners from a local jail escaped. Chincha - Many were killed at Chincha. Most of the houses, hotels and and business at Totoritas Beach were heavily damaged or destroyed. Paracas - There was considerable damage to the area known as Cathedral and the Friar. The Paracas Hotel sustained damage. Fortunately the fishing plants were not affected. Canete - In the area known as Coayllo de Canete, about 117 kms. south from Lima, 30% of the houses collapsed and many people died. Also collapsed was a historical XVI century church of great architectual and historical value. Nasca - No serious damage occurred. Lima - There was considerable damage. Anout 20 homes collapsed, walls of a school were damaged and there was also damage to an electical power station. Six people died in Callao - Lima's port city - and one in Free Town. In Miraflores, a multistory building where 70 families resided was damaged and declared inhabitable. Lima TV showed footage of traffic lights in Lima swaying with the quake. There were several power outages. Huancavelica - Between 30 - 40 percent of the houses in the provinces of Huaytar and Castrovirreyna, that are contiguous with the department of Ica, collapsed after the strong earthquake. There was considerable damage to structures at San Juan de Castrovirreyna, Huaytar, Cordova, Santa Rosa, Castrovirreyna and Tantar. Also a government building and a church collapsed . Many people were injured. Junin - Twenty-three schools in Junin and in Chupaca were damaged. Based on the large magnitude of the earthquake, the Pacific Tsunami Warning Center in Honolulu, issued a tsunami warning for Peru, Chile, Ecuador and Colombia, and a tsunami watch for Panama, Costa Rica, Nicaragua, Guatemala, El Salvador, Mexico and Honduras. The warnings later were canceled, along with a tsunami advisory issued for Hawaii. An instrumented buoy off the coast of Chile, about 440 miles (708 kilometers) from the earthquake epicenter recorded a wave of about a foot. The Peru-Chile Trench - also known as the Atacama Trench - is the active boundary of collision of the Nazca Plate with the South American Plate. According to Le Pichon et al. (1973), the velocity of subduction of the Nazca plate near the south Chile and north Peru region is about 8.7 - 8.8 cm/y. The earthquake occurred along an area of high seismicity on the west coast of Peru where large eqarthquakes occur frequently. The activity of this zone is most pronounced on the western side and lies between the Andean mountain block and the Peru-Chile Trench. This narrow seismic band (100-150 Km wide) is under Peru's Continental Shelf and is characterized by shallow earthquake activity and has great tsunamigenic potential (Pararas-Carayannis, 1968, 1974). As explained in other reports (see links below) presented at this web site, the subduction of the Nazca plate beneath the South America continent is not homogeneous. As a resut , asperities and structural complications have caused segmentation along the entire margin, resulting in zones with different rates of slip, seismic activity, volcanism, uplift, terracing and orogenic processess. Different sections of the margin along the Great Peru-Chile Trench, are segmented by fractures or by converging oceanic ridges. Each segment along the coastal region of Peru has its own characteristic parameters of collision and structural geometry and, thus, different source mechanisms for large earthquakes and potentially destructive tsunamis. Seismicity of the Central Peru Region - The historical record supports that the rate of subduction is not uniform and there is significant fragmentation along the entire length of the margin as well as differential uplift of the continental block. Certain tectonic block segments along the Peru-Chile tectonic boundary have the capability to generate very large earthquakes. Strong, destructive earthquakes and active orogenesis are evident off Northern/Central Peru between the Mendana Fracture Zone (MFZ) and the Nazca Ridge. Even though the Nazca Plate appears to be subducting smoothly and continuously at about 7-9 cm/yr into the Peru-Chile trench in this region of Northern/Central Peru, the deeper parts of the subducting plate appear to break into smaller pieces that become locked in place for long periods of time before generating large earthquakes. The region (from 7.5 to 12.5 degrees South latitude) has produced at least seven destructive earthquakes. These occurred on: 9 July 1586; 13 November 1655; 20 October 1687; 28 October 1746; 30 March 1828; 24 May 1940 (M = 8.4); and 17 October 1966 (M = 7.5) (Pararas-Carayannis, 1974). Of these, the earthquakes of 1586, 1687, 1746, 1828, 1966 and 1996 are documented to have produced destructive tsunamis (lida el al., 1968, Pararas-Carayannis, 1974; Pararas-Carayannis, 1996). 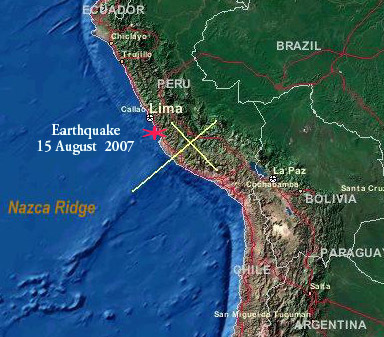 The earthquake of August 15, 2007 occurred between the rupture zones of the 1974 Lima and of the 1996 Nazca earthquakes. This is a segment which had been identified as a seismic gap (Tavera and Bernal, 2005). The earthquake generated a destructive local tsunami along the coastal area of Chincha Alta of Central Peru. Most of this coastal area is uninhabited desert. The first of the tsunami waves reached the immediate coastal area within 10-20 minutes after the earthquake. There was sufficient time for local authorities to issue a warning in the immediate area. Prompt evacuation of coastal fishing villages saved many lives. However, no warning could reach communities further south in the Paracas peninsula - and lives were lost. An interrnational team that subsequently surveyed the area determined that the tsunami's maximum runup was up to 10 meters. There was no recording of the tsunami by a tide gauge in the immediate area. The closest tide station at Puerto General San Martin, about 55 km south of the epicenter, was damaged by the earthquake and did not function. Distant tide gauge stations recorded only a small tsunami. The Callao/La Punta tide station in Peru measured a tsunami height of about 1 meter. In Chile, the Arica tide gauge measured 36 cm, the Coquimbo station measured 28 cm and the gauge at Valparaiso recorded 17 cm. Tsunami Generating Area - The tsunami generating area was in the offshore area along the Chincha Alta of Central Peru. A preliminary fault plane solution (Ji & Cheng, 2007) indicates that the earthquake's rupture occurred along a plane which had and overall strike orientation of about 324 degrees and a dip of about 27 degrees. The rupture was constrained by asperities to the north and to the south. The tsunami was generated by crustal displacements that were approximately 190 km along the quake's strike and 95 km along its dip. The aftershock distribution is consistent with these dimensions for the tsunami generating area. Pisco - Many boats were carried inland and were deposited in the town's streets. Paracas Peninsula - The tsunami runup ranged from about 3 meters at the north end of the Paracas Peninsula to about 10 meters further south. At Paracas there was considerable damage to the dock facility from liquefaction associated with the strong ground motions of the quake and subsequently from the tsunami waves. Lagunilla - The tsunami waves inundated up to 2 km inland along the very flat area south along the Paracas Peninsula. Seven people died. According to reports, the bodies of three of the victims were recovered 1.8 Km inland. The earthquake of August 15, 2007 was caused from faulting along the boundary where the Nazca plate subducts beneath the South American plate. The rate of tectonic plate convergence in this area is about 77 mm per year. However, as stated previously, the angle of subduction of the Nazca oceanic plate beneath the South American plate is not uniform along the entire segment of the Peru-Chile Trench fronting Peru. The angle of subduction is apaparently affected by buoyancy forces of the bounding oceanic ridges and fractures - such as the Mendana Fracture Zone (MFZ) to the North and the Nazca Ridge to the South in Northern/Central Peru. Changes in the geometry of subduction as well as heterogeneous compressive forces may also affect the tsunami generating mechacnisms, particularly near regions where oceanic ridges converge the continent - which may also limit the extent of earthquake ruptures. The overall subduction in the Peru segment of theTrench begins with a dip of about 30 degrees. However, seismic reflections studies indicate that it then flatens out and becomes sub-horizontal between 100 and 150 km depth beneath Peru, before steepening and descending into the earth's mantle. Also, seismic studies indicate that the flat slab segment exhibits a 20-40 km lithospheric "sag", approximately mid way between relative highs from Latitude 5 degrees South and Latitude 13 degrees South. This suggests a double buoyant plateau model, with the Nazca Plate supported by two light bodies - the Mendana Fracture Zone (MFZ) to the North and the Nazca Ridge to the South. Such "saging" due to buoyancy forces would be expected to affect the source mechanisms of earthquakes, particularly near areas where an oceanic ridge, such as the Nazca Ridge, intercepts the continent. In fact the epicenter of the earthquake of August 15, 2007 was at Latitude 13.353 S, very near the region of Nazca Ridge convergence with the South American continent. Not only seismic reflection studies, but studies of mineral concentrations along Peru, provide additional clues for such geotectonic anomalies (that also determine whether a destructive tsunami will be generated along a specific segment of the active marginal convergence zone). Specifically, magmatic-hydrothermal ore deposits found in the Andes and along certain coastal regions of Peru have been correlated to past distinct and sudden metallogenetic episodes during the last 200 Ma - episodes not necessarily associated with progressive eastward movement of the Nazca plate beneath the continental South American plate (Rosenbaum et al. 2005 A, B). Also, some of these magmatic-hydrothermal ore deposit concentrations were found in regions of Peru associated with aseismic ridge subduction. The localized concentrations of ore deposits suggest the existence of crustal heterogeneities within the subducting oceanic plate (the Nazca plate) - which are particularly prevelant in the Southern Central Peru region. These heterogeneities may be caused by the suspected crustal buoyancy anomalies which affect the dynamics of the subduction system in this particular region of Peru (near the Nazca Ridge in central Peru where the August 15, 2007 earthquake occurred). Accordingly, there may be laterally migrating zones of flat ridge subduction which could account why the great M+8.1 magnitude earthquake of 15 August 2007 did not generate a tsunami of great far-field significance as other earthquakes further north or further south have done. Also, in the vicinity of the Nazca Ridge intersection with the South American continent, it appears that there is a northward kink in the subducting extension - which would also support the existence of different tectonic geometry by northward-trending lateral compressive forces - the same forces that have formed the Paracas peninsula ending at Punta Huacos. Thus, the length of earthquake caused ruptures in this region is limited. This is a reasonable explanation why the earthquake of 15 August in the region did not generate a destructive tsunami elsewhere except the immediate region. 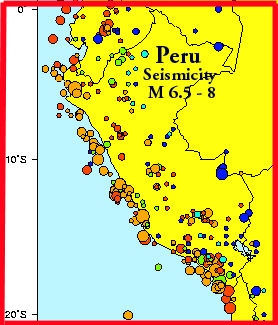 From this preliminary analysis we can reasonably conclude that earthquakes further north and south of the Nazca Ridge have the potential of generating local destructive tsunamis in Peru with more extensive far-field impact , but that region near the Nazca Ridge intersection appear to have shorter ruptures and a diminished potential for far-field destructive tsunami generation. The Peru-Chile Trench is a manifestation of very active subduction along the South American continent. Most of the destructive tsunamis along the South American coast have been generated from major or great shallow earthquakes - east but in close proximity to the Peru-Chile Trench. Deeper earthquakes, along the Beniof Zone (which is quite wide and flat in this area of Southern Peru) do not produce tsunamis. Historically, the large earthquakes along the Peru-Chile Trench above latitude 16 degrees South have produced locally destructive tsunamis but not destructive Pacific-wide tsunamis. The real destructive Pacific-wide tsunamis have been generated a little further south along the coast of Chile. The 1868 Pacific wide tsunami, characterized as the "Great Peru earthquake and tsunami", which destroyed Arica (then part of Peru), had its epicenter further south - in what is now northern Chile (around 18.5 South). The 1960 Pacific-wide tsunami was generated by a huge earthquake which had its epicenter at about 37.5 South latitude. The reason this tsunami was so destructive in Hawaii, Japan and elsewhere in the Pacific, was that the 1960 earthquake's rupture extended along a strike length of about 900-lOOOkm. Review of the historic record indicates that most of the earthquakes along the entire coast of Peru have had relatively short rupture lengths and therefore have generated only local destructive tsunamis. For example the 1966 tsunami which was generated by a large earthquake in the central part of Peru's seismic zone 4, had a rather short rupture of about 120 km (Pararas-Carayannis, 1968, 1974). It did not produce a Pacific-wide tsunami. Similarly, the June 23, 2001 Peru earthquake had a relatively short rupture (estimated at 152 km) and it did not generate a large Pacific- wide tsunami. 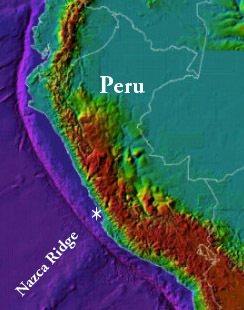 The obliquity of convergent tectonic plate boundaries along this region of southern Peru may be the reason for the shorter rupture lengths. The gradients in obliquity appear to change south of 18.5 South Latitude as a consequence of the geometry of tectonic plate motions. Rupture lengths of major earthquakes are longer and the tsunamigenic potential is greater, further south. For example, the May 9,1877 (Mw 8.8) quake near Iquique, had a rupture of about 420 km along the coast of Chile and extended from 18 South to 23 South and generated a destructive Pacific-wide tsunami. The tsunami wave heigths reached 24 meters in Chile and up to 5 meters in Hawaii ( Pararas-Carayannis 1969; Pararas-Carayannis andCalebaugh, 1977). Further south, the November 10, 1922 earthquake (Mt 8.7) in Northern Chile, had a rupture of about 300-450 km-long, extending from about 26.1 to 29.6 South. It generated also a Pacific-wide tsunami - although not as large as that generated by the 1877 or 1868 earthquakes. 1586, 9 July - 0 30 Reconstructed Epicenter - 12.20 South 77.70 West, Off Lima/Callao, Peru. Reconstructed Magnitude 8.5 3.5 4.0 26.00 5 L 20 T 4 Destructive Tsunami. The shore inundated for 10 km inland. Tsunami Height at Trujillo 26 meters. 1655, 13 November - 19 38 Reconstructed Epicenter 12.00 South, 77.00 West, Off Lima/Callao. No details. 1687, 10 20 - 9 30 Reconstructed Epicenter 13.50 South, 76.50 West Magnitude 8.5 3.5 1.0 8.00 14 M 5000 T 4 SAM LOC Off Callao. At Callao and Chancai Pisco, the sea retreated then returned with great violonce. Town and market were destroyed. No other details. Near Callao the tsunami height was 24 meters. Portion of the coast sank producing a bay. All ships in the harbor were destroyed or beached. One ship stranded about 1.5 km inland. Of 5,000 inhabitants only 200 survived. At Cavallos, Chancay and Gaura the effects of the tsunami were similar. 1828 3 30 - 12 35 Reconstructed Epicenter 12.10 South, 77.80 West 50 8.2 No details available. 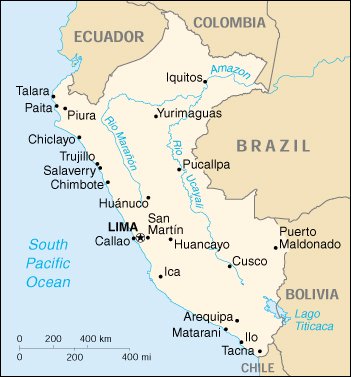 Only that the tsunami was destructive to cities north of Lima (Callao). 1942 August 24 - Epicenter 15 South 76 West, Magnitude 8.1 Shallow. Tsunami at Callao - 1.6meter wave with period of 30 min. Travel time to Callao 0.7 hour; At Matarani 0.5 meters, Travel Time 1.7 hour. Tsunami wave period 21 min. Barazangi M. and B. Isacks, Spatial distribution of earthquakes and subduction of the Nazca plate beneath South America, Geology 4 (1976) 686-692. Beck, S., and G. Zandt (2002). The nature of orogenic crust in the central Andes, J. Geophys. Res. 107(B10), 2230. Bevis M., The curvature of Wadati-Benioff zones and the torsional rigidity of subducting plates, Nature 323 (1986) 52-53. Cahill T. , and B.L. Isacks, Seismicity and shape of the subducted Nazca Plate, J. Geophys. Res. 97(1992) 17503-17529. Cande S.C. and W.F. Haxby, Eocene propagating rifts in the Southwest Pacific and their conjugate features on the Nazca Plate, J. Geophys. Res. 96 (1991) 19609-19622. Engdahl E.R. , van der Hilst R.D., and J. Berrocal, Imaging of subducted lithosphere beneath South America, Geophys. Res. Lett. 22 (1995) 2317-2320. Fisher, R. L. and Raitt, W. R. (1962); "Topography and Structure of the Peru-Chile Trench", Deep Sea Res., 9, 423-443. DeMets,C., GordonR.G. Angus D.F. , and C. Stein, Current plate motions, Geophys. J. Int. 101 (1990) 425-478. Dorbath, L., Cisternas, A., and Dorbath, C. 1990, Assessment of the Size of Large and Great Historical Earthquakes of Peru, Bull. Seismol. Soc. Am. 80(3), pp. 551 - 576. Gutenberg, B. and Richter, C. F., 1956. Earthquake magnitude, intensity, energy , acceleration, 2. Bull. Seismo!. Soc. Am., 46 (2):105-143. Hasegawa A. andd I.S. Sacks, Subduction of the Nazca Plate beneath Peru as determined from seismic observations, J. Geophys. Res. 86 (1981) 4971-4980. Iida, K., D. Cox and G. Pararas-Carayannis, (1968). "Prelim. Catalogue of Tsunamis Occurring in the Pacific Ocean", Hawaii Institute of Geophysics, Univ. of Hawaii, Data Rept. No. 5. Jischke M. , On the dynamics of descending lithospheric plates and slip zones, J. Geophys. Res. 80 (1975) 4809-4813. Kay, S.M. and J.M. Abbruzzi, Magmatic evidence for Neogene lithospheric evolution of the central Andean "flat-slab" between 30 S and 32 S, Tectonophys. 259 (1996) 15-28. Lomnitz, C., and Cabre' R. 1968, "The Peru Earthquake of October 17, 1966", Bull. Seism. Soc. Am., Vol. 58, No. 2, pp. 645-661, April. McGeary S. , Nur A. , and Z. Ben-Avraham, Spatial gaps in arc volcanism: The effect of collision or subduction of oceanic plateaus, Tectonophys. 119 (1985) 195-221. Newman A.V., and Okal, E.A., 1996, Source Slowness of the February 21, 1996 Chimbote Earthquake Studied from Teleseismic Energy Estimates, EOS 77(17), S184. Norabuena E. , Snoke J.A. , and D.E. James, Structure of the subducting Nazca Plate beneath Peru, J. Geophys. Res. 99 (1994) 9215-9226. Lomnitz, C., and Cabre' R. (1968). "The Peru Earthquake of October 17, 1966", Bull. Seism. Soc. Am., Vol. 58, No. 2, pp. 645-661, April. Ocola, L. (1966). "Earthquake Activity of Peru", Am. Geophys. U., Geophys. Monograph 10, 509-528. Pararas-Carayannis, G. (1968). "The Tsunami of October 17, 1966 in Peru", International Tsunami Information Center Newsletter, Vol. 1, No. 1, March 5. Pararas-Carayannis, George (1969). Catalog of Tsunami in the Hawaiian Islands. World Data Center A- Tsunami U.S. Dept. of Commerce Environmental Science Service Administration Coast and Geodetic Survey, May 1969. Pararas-Carayannis, G. (1974). "An Investigation of Tsunami Source Mechanism off the Coast of Central Peru". Marine Geology, Vol. 17, pp. 235-247, Amsterdam: Elsevier Scientific Publishing Company. Pilger R.H., Plate reconstructions, aseismic ridges, and low-angle subduction beneath the Andes, Geol. Soc. Am. Bull. 92 (1981) 448-456. Sacks I.S. , The subduction of young lithosphere, J. Geophys. Res. 88 (1983) 3355-3366. Spence W. , C. Mendoza, E. R. Engdahl, G. L. Choy, E. Norabuena, 1999. Seismic Subduction of the Nazca Ridge as Shown by the 1996­97 Peru Earthquakes. JournalPure and Applied Geophysics, Earth and Environmental Science Issue, Volume 154, Numbers 3-4 / May, 1999Pages, 753-776. Swenson, J. L. and S. L. Beck 1999. Source characteristics of the 12 November 1996 MW 7.7 Peru subduction zone earthquake, PAGEOPH 154(3-4), 731-751. Tavera, H., and Bernal, I., 2005. Spatial distribution of rupture areas and seismic gaps in the western coast of Peru. Volumen Especial No. 6, Alberto Giesecke Matto, Sociedad Geologica Del Peru, p. 89-102 (in Spanish). Tavera, H., Bernal, I., and Salas, H., 2007. The August 15, 2007 (7.9 Mw) Pisco Earthquake, Ica Department, Peru (Preliminary Report), Boletin Sociedad Geologica, Instituto Geofisico del Peru, August 2007 (in Spanish). von Huene R. , Pecher I., and M.-A. Gutscher, Development of the accretionary prism along Peru and material flux after subduction of Nazca Ridge, Tectonics 15 (1996) 19-33.